Margaret Forgione was appointed Chief Operations Officer in September 2016. In this position she oversees all agency operations, including the Staten Island Ferry, Bridges, Roadway Repair & Maintenance, Sidewalks & Inspection Management, Traffic Operations, Transportation Planning & Management, OCMC, and the Borough Commissioner Offices. Prior to serving as Chief Operations Officer, Ms. Forgione worked as New York City DOT’s Manhattan Borough Commissioner. In that position, she was the primary liaison to the community, including elected officials, community boards, business improvement districts, advocacy groups, and individuals. She oversaw a number of projects including the implementation of the Times Square Plaza, the City’s first on-street protected bike lanes, and the rollout of Citi Bike. She was also responsible for monitoring and expediting service requests from local stakeholders and organizations by coordinating with the DOT operating units. Previous positions in the Department include Director of Arterial Maintenance, Director of the Adopt-a-Highway and Banner Programs, and Special Assistant to the First Deputy Commissioner. 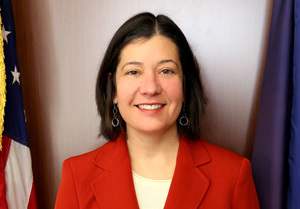 Ms. Forgione received a Bachelor of Science degree from the University of Connecticut, and a Master of Public Policy and Administration degree from Columbia University.